Good news to those planning on planting asparagus. It is not affected by a lot of pests so growing them won’t be as hard as other crops. New asparagus cultivars are also made/bred to resist not just pests but diseases. Nevertheless, some pests, no matter how small the number, still affect this delicious vegetable. Some of these include asparagus beetle, asparagus aphids, caterpillars and slugs. 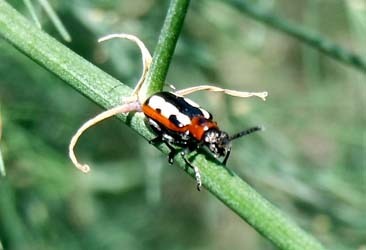 The asparagus beetle feed on any ‘meaty’ part of the asparagus that is above the ground. Aside from that, they also leave brown scars on asparagus buds. How does the asparagus beetle look like? They have a smooth, elongated body approximately six millimetres long. The head is metallic blue with wing covers of the same colour. Control of this pest is easy when detected early—simply hand-pick them. You would know your asparagus is infested by aphids if you see a brush-like appearance on the foliage. Asparagus aphids lay their eggs at the base of the stalks. Infestation of this pest can cause stunted growth and reduced yields in mature plants, but would kill seedlings. To control asparagus aphids, get rid of dead ferns during fall and winter. Till the soil regularly in spring. You can also use a systematic insecticide to control the proliferation of this pest. Asparagus aphids are pale-green to gray in colour. It is oval in shape and its body is covered in a waxy secretion. Sometimes called beet armyworm, this caterpillar has a colour ranging from green to black with light-coloured stripes across its body. This pest eats buds, leaves and tips that leave the asparagus deformed. Caterpillars also eat the roots but they are usually not seen as they hide in the soil. To manage armyworms, it is important to get rid of weeds as they grow. There are also organically-acceptable ways to control their proliferation such as spraying of Bacillus thuringiensis.